Removing excess hair doesn’t just give you flawless skin—it reassures every high-five, any surprise beach day, and each intimate touch. Let’s drop the plucking, shaving, and waxing from your routine for good and give you the confidence to show off your body no matter what comes your way. 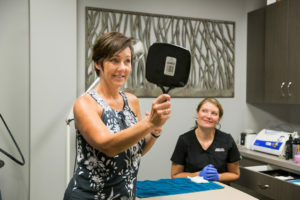 During a laser hair removal treatment at Center for Dermatology, our aesthetician uses a handheld laser that delivers short bursts of light onto the skin. This light heats and destroys the hair follicles while cooling the surface skin and protecting it so there is no damage. Laser hair removal works best on darker hair, ideally on contrasting skin and hair (for example fair skin and dark brown hair). This treatment is great for both men and women and is very safe. For the best results, we ask that you refrain from waxing or plucking for several weeks before the procedure and avoid excessive sun exposure or tanning. We start your treatment by placing a mild anesthetic cooling gel onto your skin. You’ll also receive eye protection to keep your eyes safe. We’ll then slowly move the handheld laser over your skin as it begins to destroy your hair follicles. You may feel some heat, but the procedure is generally short with minimal pain. Patients often say it feels like a rubber band snapping on the skin. Treatment time depends on the size of the areas treated. Your treated areas may look red and feel sore (like a mild sunburn) but this normally resolves within a day or two. We may suggest a cream or ointment to help with inflammation and recommend you wear sunscreen. You’ll begin to see results over the next few days, though permanent hair reduction requires several sessions for hair to stop growing. The total number of treatments varies by skin type, hair color, and hair coarseness, and most patients need repeated treatments about every six weeks over six months. After that, you’ll have smooth, hair-free skin with only occasional touch-ups needed. For additional information about laser hair removal services for men or women, or any cosmetic dermatology service, please contact our Lakeville office today at (952) 469-5033.